Think big this spring with the Giant Hyacinth Mixture. Prepare to be amazed as masses of starry flowers cluster together to form large, spire-shaped blooms. This vivid mix showcases a range of vibrant colours such as white, coral, and yellow, as well as various shades of pink, red, purple, and blue. These fabulously fragrant flowers bloom in early to mid spring and are deer resistant. To ensure that your Dutch hyacinths reach their full-bodied potential, plant them in the fall. 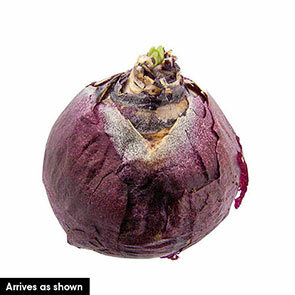 Bury your hyacinth bulbs in an area with well-drained clay, loamy or sandy soil, about 6 inches deep and 4 to 6 inches apart. These gentle giants equally enjoy bathing in full sunlight or brightening up partially shady areas. Your hand-picked mixture of Hyacinth orientalis will thrive in hardiness zones 4 through 8. Each flower in this collection grows 8 to 10 inches tall, making them excellent for front borders or low beds. Create contrast by pairing their thick blooms with tall, luxurious lilies, or consider arranging your bulbs in long rows to create dense, playful contours in your yard. These versatile perennial hyacinths also take well to containers and are easily forced indoors. Spread their sweet scent throughout your home by including them in stunning spring flower bouquets. 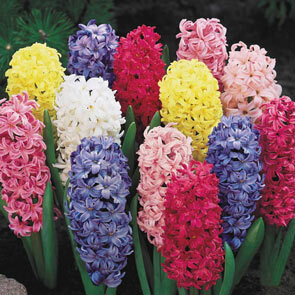 Reach new heights of beauty with the Giant Hyacinth Mixture. Glorious fragrance and colour for your garden. This jewel-like mixture of hyacinths literally sparkles in the spring sunlight. The combination of fabulous colour and irresistible fragrance creates your own spring garden fantasy. Larger, garden-size bulbs have been specifically selected by Breck's® to provide you with strong and impressive hyacinths loaded with scented florets. Try them in a bouquet and bring the spring indoors!